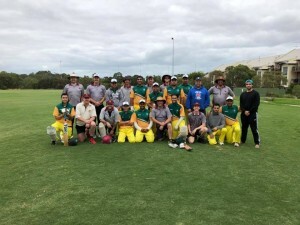 What a great Game between the Quokkas and the ANSC! The toss was had and won by us (thankfully) and we sent it the All Nations guys for a bat. Luckily for us the we had the ball swinging and seaming and everyone managed to bowl good line and length, a rare treat for the quokkas. I managed to make the first breakthrough with a wayward delivery down leg which caught the back of the bat and was held on to in the deep by pup. The batsmen crossed and I had the other opener caught behind very next ball, on a hatrick!! We bought the field in and had 3 slips, a first for pub cricket, and I was belted back over my head. Enter Dutchy: Some brilliant spin bowling and some excellent keeping by Radar had the batsmen stumped as he chased one down the wicket on the last ball of the over. His next delivery yielded the very same result, on another hat-trick!! Unfortunately no luck on the third ball but the Quokkas were in good nick thats for sure. Some excellent batting by the ANSC got them in a solid position toward the end of the innings and left us with a decent but chase-able total to reach to win the game. Radar and local opened and got us off to a solid start before Radar was clean bowled by a great delivery. Enter Pup. Pup played some great strokes early in his innings including a very nice cut shot for 6. Local departed soon after. We then lost a string of wickets quickly and were looking wobbly. Pup retired and I took his position. The first bit of bat I’d gotten on anything in 3 games was hit straight in the air and I was gone as soon as I was in. It was up to Snipper and Alex to save the game and we were looking good until Snipper departed, sending pup back in to finish the innings. A strong fight between Alex and Pup wasn’t enough to save the day as the ANSC came out on top to take a much deserved win!! All in all a great game of cricket.